Baking and Mistaking: Apple Pie update! Remember when I told you it was too painful for me to show you a picture of my disastrous apple pie? (If you forgot, just scroll down). Well, that was party true. 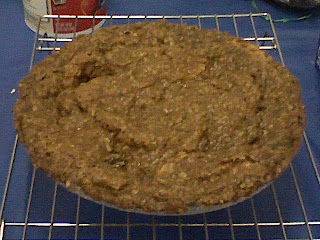 But it was also partly because I didn't think I actually had a picture of the pie after its completion. Sometimes, things just get away from me, and baked goods get eaten before I get a chance to photograph them. I know, I know, its atrocious. But guess what! I found one! It doesn't look so bad, right? In fact, it might look....delicious? Well, looks can be deceiving. But now your wait is over! Enjoy staring at it, and wondering what went wrong.